We bought Sam's wedding ring. He showed me the suit colors he picked and they're perfect! We picked out and put a deposit down on our wedding cake! Thanks to Uncle Sam giving me some of my money back, and Fiance Sam picking an awesome ring that turned out to be less expensive but more unique than the one we originally looked at, I had some leftover $$ *happy dance* I've already got it set for twitter, plurk, facebook, and to upload my pics to flickr. YAY! 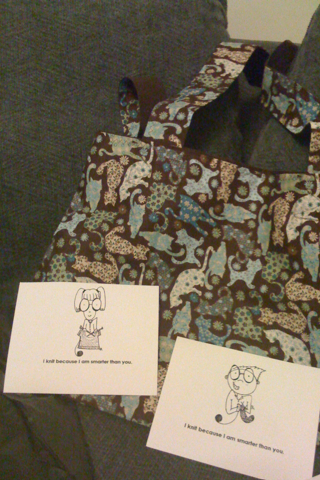 This is another bag from Slipped Stitch Studios, who I've ordered from before. I also got some super cute magnets. They say "I knit because I'm smarter than you." I got a boy and a girl, the boy is for my friend James! I don't think I could have picked out a more perfect bag for myself if I had ordered it custom. Blue and brown and KITTIES! I also received the 2nd shipment in the Poe series. 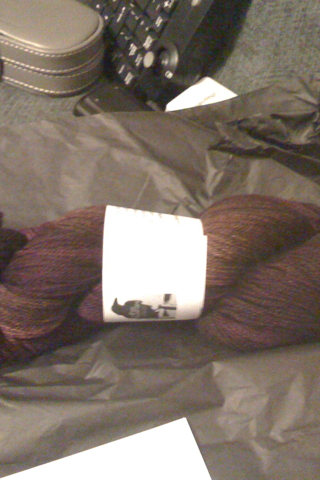 I will definitely take a better picture of this yarn tomorrow... the iphone's camera doesn't do it justice by a long shot. Tomorrow is the Sedalia Celtic Festival.. haven't decided for sure if we're going to go or not. Big thing on the list is to check out places to rent chairs. We've gotten so much done, but still so much to do! The pAnIC will set in on June 12th, Mom... don't you worry!!! Ouch - goals... damnit, I tried. Awesome, I know you have wanted an IPhone for quite a while. I think that bag was custom designed for you. Aztec Rentals is where we got the chairs for our wedding if that helps. Super duper day indeed!! Yay!! And some gorgeous packages too!